Besides being the perfect fashion accessory designed to complement your wardrobe our Holly Pet Carrier is also the perfect pet carrier. Designed to make your pet's journey as comfortable and as safe as possible. There are a mesh windows at each end of the bag to provide maximum ventilation and a sculpted window at the front which makes it possible for your pet to take in the view during your outing. It features a beautiful faux leather with outer mesh top panel with zip fastening which can be left open to let your dog peek out or closed to completely enclose them. The interior has a removable quilted easy clean liner and it also has a leash clasp for extra safety. The rear of the bag features a zip pocket that is perfect for carrying either your dog’s bits and pieces, or your own come to that! 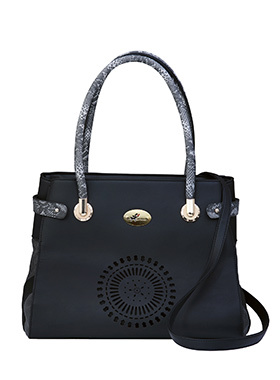 It can be carried by hand or over the shoulder using the removable shoulder strap provided.